National-level members of the Humidtropics research-for-development platform (photo credit: ILRI/Apollo Habtamu). Written by Zelalem Lema, research officer, innovation systems at ILRI and Dorine Odongo, communications specialist at ILRI. 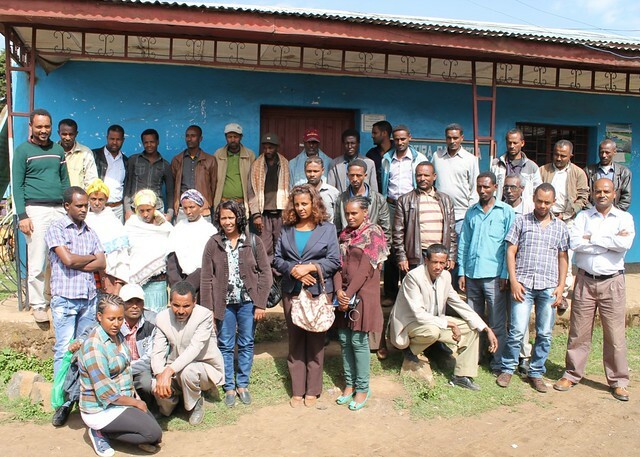 The CGIAR Research Program on Integrated Systems for the Humid Tropics (Humidtropics) has been implementing action research activities in Ethiopia since 2014 through local innovation platforms established in two field sites in Jeldu and Diga districts in the western part of the country. These local innovation platforms were established in 2011 by the International Livestock Research Institute (ILRI) as part of the Nile Basin Development Challenge (NBDC) project, which implemented natural resource management interventions for three years in these field sites. At the end of the project, livestock feed interventions for increased feed availability and improved natural resource management to reverse land degradation emerged as successful interventions of the NBDC. In 2014, the Humidtropics program continued working with the existing local innovation platforms on sustainable intensification activities and tested various crop-livestock system improvement options at both field sites. Soil and water conservation is central in Humidtropics activities in Ethiopia to improve productivity of food and feed. Through this program, an action site research for development (R4D) platform has been created, consisting of members from national and regional government line ministries, national research institutes, CGIAR centres, private sector, local NGOs, government administrators in the field sites and donors. On 5 February 2015, the Humidtropics Ethiopia Action Site R4D Platform was launched at the ILRI campus in Addis Ababa. The platform is designed to oversee, and link with, the local level innovation platforms at field sites for co-learning and guiding Humidtropics integrated research for development activities in the country. The platform’s management consists of an elected chairperson from Ambo University, a vice chairperson from ILRI and an action site facilitator from Oromia Agricultural Research Institute (OARI) who will support and facilitate meetings and field visits. Steering committee members were also elected to support technical activities in-between the meetings. Meetings of the general assembly will be held twice a year. During the inaugural R4D platform meeting, ILRI presented draft terms of reference, which were discussed and endorsed by members. 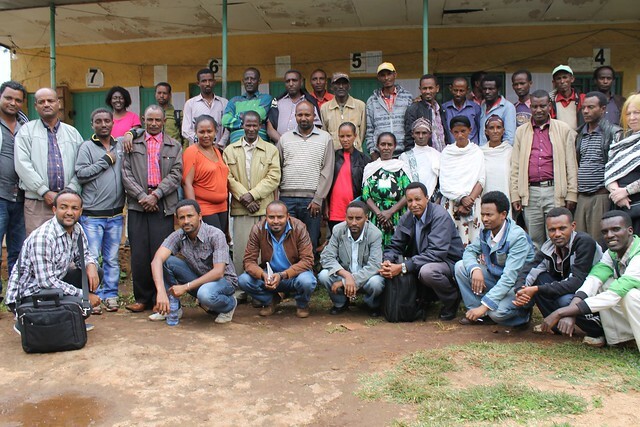 Representatives from CGIAR centres with activities in the Humidtropics program in Ethiopia also presented the activities they accomplished in 2014 and shared their proposals for 2015. Two CGIAR centres, the World Agroforestry Centre (ICRAF) and Bioversity International, which have joined the program this year, presented their proposals for 2015 at the meeting.Other CGIAR centres working in Humidtropics program include the International Water Management Institute (IWMI) and the International Potato Center (CIP). At the meeting, IMWI presented ideas for improving soil and water conservation in crop-livestock production systems through local innovation platforms, while ILRI gave a proposal on innovation platform facilitation and livestock feed development. CIP, in collaboration with ILRI and local innovation platforms, shared experiences from ongoing activities in integrating market-oriented livestock feed interventions with natural resource management and crop intensification as well as information on a project that is increasing farmers’ access to market for potato. The Oromia Agricultural Research Institute shared plans to introduce and integrate quality protein maize and new teff varieties in one of the field sites to increase productivity and improve nutrition. Interventions to improve livestock feed for the dry season by integrating existing local feeds with silage from sweet potato vines and inedible roots formed a key element of proposed Humidtropics activities for 2015. Different projects including N2 Africa, Legume CHOICE and Africa RISING will be mapped into this platform to share findings and best experiences. During the event, representatives from ICRAF presented the new Humidtropics funding mechanism that will allow innovation platform members to apply for additional funding to carry out new research-for-development trials. 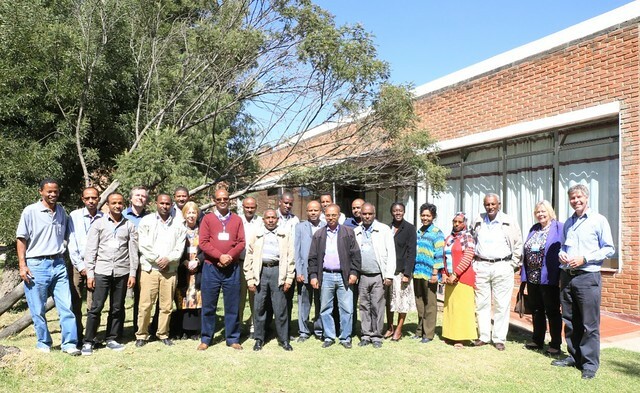 Steering committee members and representatives from each CGIAR centre then drafted a proposal for the project based on the discussions and partners renewed their commitment to collaborate towards sustainable intensification options in Ethiopia.